Take butter out of the refrigerator half an hour before cooking. It should be soft but not melted and shapeless. Cut butter into cubes, add flour. Mix butter and flour with your hands. Then add yogurt, sugar, salt and knead the dough. Make a ball of the dough and wrap it in plastic wrap and put into the fridge for half an hour. Cut plums in halves, remove the seeds and cut plums into slices. If the plums are very sweet - there is no need to add sugar to the filling. If the plums are too juicy - you might need to put them in a bowl with starch and stir very gently. Roll out the dough on a baking parchment. Since the whole grain dough is not as plastic as a usual one - it will form cracks on the edges. Don't worry! Just roll out a circle of larger diameter, cut the excess (use any round shape, a plate for example), cover the cracks with the dough you cut and roll with a rolling pin again. 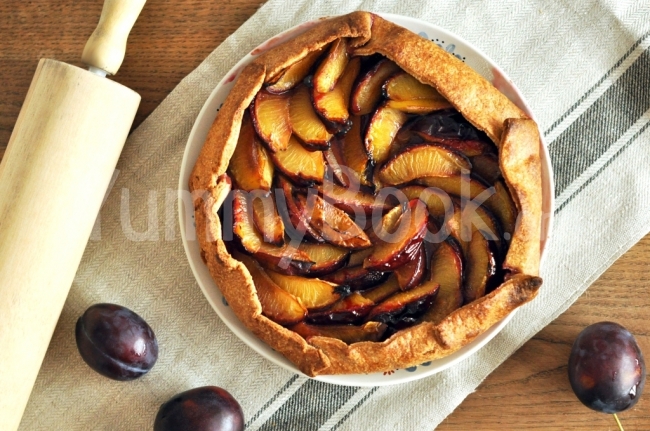 Put plums to the middle of the dough. Slightly sprinkle with sugar. Wrap the edges of galette to the center. Transfer the parchment on a baking sheet and bake for 25 minutes at 190 degrees. Serve hot or cold! Bon Appetit!